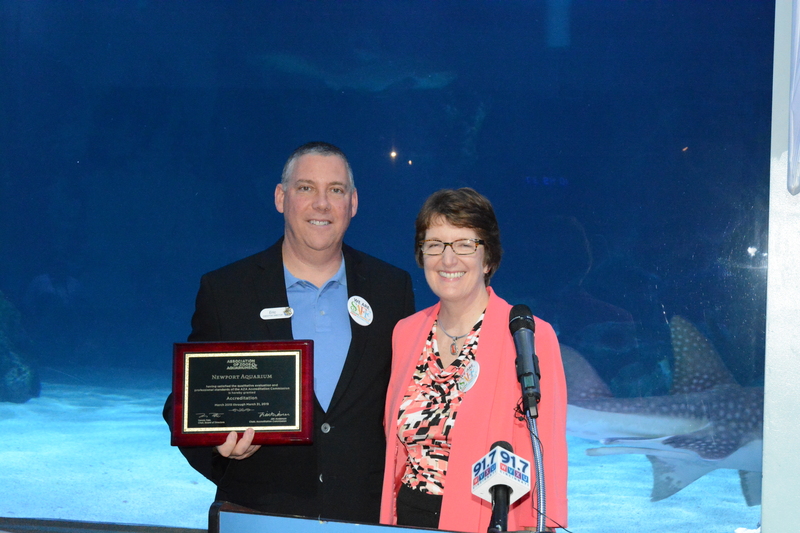 Newport Aquarium Executive Director Eric Rose (left) receives the aquarium’s renewed accreditation from Association of Zoos & Aquarium Executive Director Kris Vehrs. NEWPORT, Ky. — On Endangered Species Day, an international initiative to help save species from extinction and restore them to healthy sized populations in the wild was publicly announced to the world from Newport Aquarium. Standing in front of Newport Aquarium guests and elected officials at Shark Ray Bay theater, the executive director of the Association of Zoos & Aquariums (AZA) Kris Vehrs detailed a new campaign entitled SAFE: Saving Animals From Extinction (SAFE). “By focusing the wild animal care, conservation, and science expertise of our 229 AZA-accredited zoos and aquariums and our conservation partners with the power of activating our 180 million annual visitors, we believe SAFE will be a game changer for global conservation,” said Vehrs. Initially, SAFE will focus on 10 key species from a list of more than 100 that are facing serious threats and are critical to maintaining overall ecosystems. Newport Aquarium exhibits three of those species: African penguins, sharks and sea turtles. 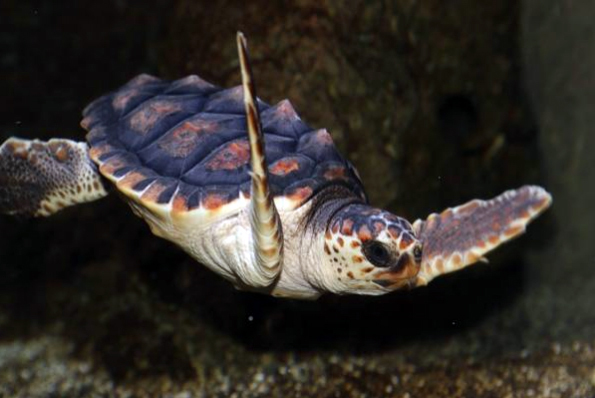 Sea turtles are one of three species at Newport Aquarium that are now part of the SAFE program. Every year for at least the next decade, 10 species will be added to SAFE based on the most current science and the availability of resources. Vehrs also announced the renewal of AZA accreditation to Newport Aquarium, which opened its doors 16 years ago to the day on May 15, 1999. Newport Aquarium will be raising awareness for the SAFE program and recognizing Endangered Species Day all weekend long, May 15-17, with special programming geared toward educating guests about the everyday actions they can take to help with animal conservation. Founded in 1924, the Association of Zoos and Aquariums is a nonprofit organization dedicated to the advancement of zoos and aquariums in the areas of conservation, animal welfare, education, science, and recreation. AZA is the accrediting body for the top zoos and aquariums in the United States and seven other countries. Look for the AZA accreditation logo whenever you visit a zoo or aquarium as your assurance that you are supporting a facility dedicated to providing excellent care for animals, a great experience for you, and a better future for all living things. The AZA is a leader in saving species and your link to helping animals all over the world. To learn more, visit aza.org. SAFE: Saving Animals From Extinction combines the power of zoo and aquarium visitors with the resources and collective expertise of AZA-accredited zoos and aquariums and partners to save animals from extinction. Together we are working on saving the most vulnerable wildlife species from extinction and protecting them for future generations. To learn more, visit AZAsavingspecies.org. This entry was posted in Uncategorized and tagged African penguins, AZA, endangered species, Endangered Species Day, newport aquarium, savingspecies, Sea Turtles, sharks by NewportAquarium. Bookmark the permalink.